Do you have a bond issue or levy to pass this year? Join other successful school districts by using The Education Connection’s (TEC) automatic outbound dialing feature to create a multi-level poll to glean areas of concern from the community. The Education Connection boasts a 90% passage with its rental systems used to educate community members on the importance of passing levies and bond issues. TEC customers enjoy free usage of our calling services. We offer our services as an in-kind donation to the district's levy committee. The committee can use TEC to place voter registration calls and even deliver messages ask for the community's support for the funding issue. The Committee has the ability to utilize TEC to support the funding issue because we maintain as separate system housed in our Centerville, Ohio office which is not funded by district dollars. This separate system is not operated by District tax dollars so the levy committees are able to freely utilize our communication tools and be in compliance with state election laws. 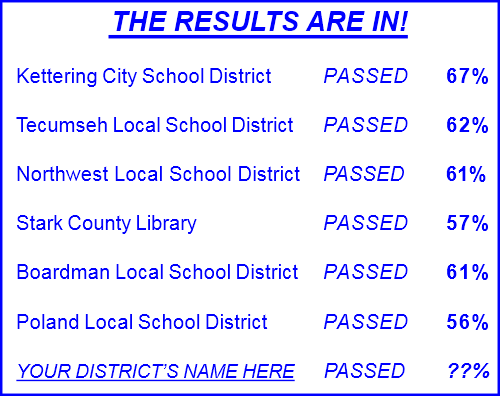 1) Your district CAN find out from the local board of elections the names of all registered voters in the district and match them against your students' parents’ names. TEC CAN organize your volunteers to perform this task. 2) Your district CAN talk with these parents and explain to them why it is important for them to be registered voters and how their vote, or lack of it, impacts them directly. TEC CAN communicate that message to all parents to help rally and increase support. 3) Your district CAN help parents get registered to vote. TEC CAN invite parents to visit the school office to register to vote. 4) Your district CAN determine exactly how many votes are needed to pass the campaign issue. TEC CAN measure how many supporters your message has reached. 5) Your district CAN collect pledges of $1 or more per pro-campaign supporter who will vote in favor of the issue and utilize these pledges as funding for the campaign. TEC CAN use the resulting list of supporters to deliver targeted campaign messages. 6) Your district CAN appoint a popular spokesperson for the campaign. TEC CAN contact every voter in the district and deliver a consistent, “personal” message in the voice of your district’s popular spokesperson. 7) Your district CAN solicit the support of business leaders for the campaign. TEC CAN allow a business leader to deliver a message on the importance of quality schools in attracting future businesses to the community. 8) Your district CAN respond quickly to misleading or negative information generated by those opposing the levy or bond issue. 9) Your district can use TEC to identify citizens who will display campaign yard signs. TEC CAN map those requests for easy delivery and pick up of those signs. 10) Your district CAN rent TEC for delivering timely, informational “vote for” campaign messages. TEC CAN make it affordable and easy to deliver your message. TEC customers receive an in kind donation of this valuable service. "The campaign is over and... Our community gave us a 60/40 vote of confidence... After 25,000 calls to our entire community, we fell that the message was delivered in a timely and consistent manner."